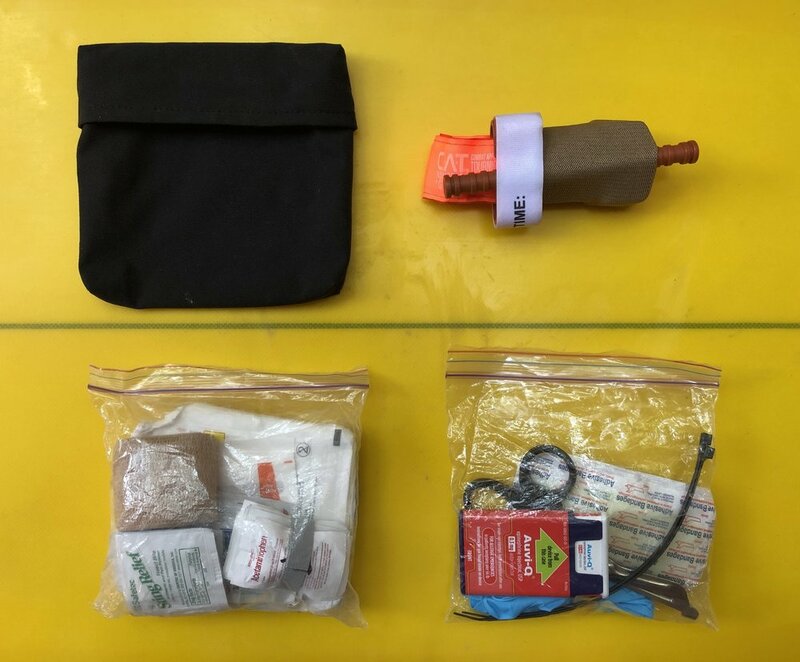 * These are only simple suggestions for a kit that we have used in our cars or board bags for the situations you might encounter. Fins, Reefs, Sharks, Kooks, and a list of other things are constantly trying to kill you when you paddle out whether you realize that or not. This is called a Tourniquet. It’s the most effective way to stop a massive fatal hemorrhage at an artery point (bleeding out). Fin to the leg, shark to the arm, etc... You do not have to be a paramedic or doctor to know how to use this but it does take about 2 minutes of reading the instructions so get one and do that ahead of time, it would absolutely save a life. The one we have on us at all times (in orange) is made by North American Rescue. They are the leading expert in the field and supply them for the US Military. They have featured and worked with Mark Healy and the Big Wave Assessment Group in the past so you know they know. The Epi Pen - You'll probably need a script for this one but that can be fixed in one visit to your doc. This one can really save you if you need it. Bees, Stingrays, Sculpin (not the beer), Box Jellys, and Peanuts could all potentially put your body into an anaphylactic shock. This little roided out pen will give your body the Hulk smash strength it needs to get to a doctor. Not allergic to anything? sure... but that strange jellyfish tentacle to the jugular is going to make it hard to swallow, let alone breath. We won't list everything above but you're going to need glaze pads and things that absorb like your tampon. Little utility items like safety pins, zip ties, and duct tape can hold a toe or finger branded to another or whatever you may need. COBAN - The most waterproof self sticking ready to roll medical tape you'll ever find. You could hold up your broken tripod or probably better with this stuff. Alcohol Swabs - If you are surfing somewhere in the world that doesn't have limes? NOT PICTURED: Crazy Glue - is made up of a non toxic chemical called cyanoacrylate. 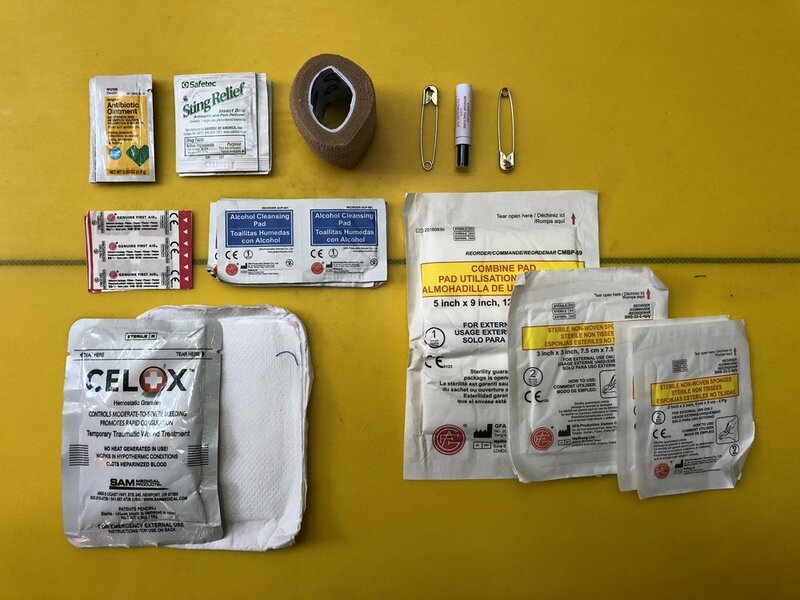 You can pile this stuff on top of cuts in leu of band-aids or even stitches if you are in a pinch. It has been stated that this stiff can help heal cuts with less scarring as the skin cells will fuse together and push the dried glue out as it binds. Although not pictured this could be the most abused portion of this kit. Remember to disinfect with limes and booze first.